The global social media analytics market is anticipated to display stellar growth in the upcoming years. Growing popularity of different social media platforms such as Snap Chat, Twitter, Facebook, We Chat, and LinkedIn that generates massive volume of data is arousing the interest of businesses to use this data for business gains. 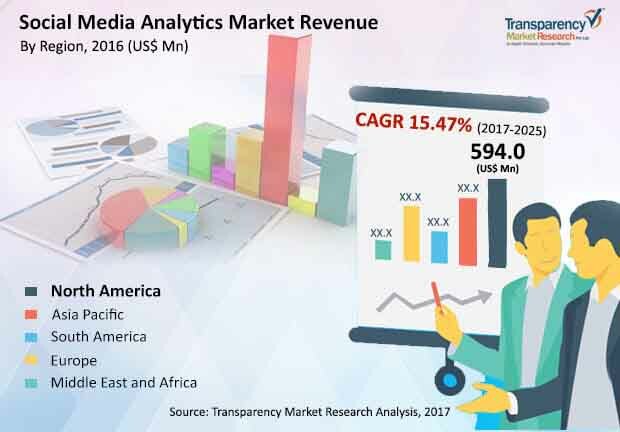 As per a new report by Transparency Market Research (TMR), the global social media analytics market is predicted to clock a CAGR of 15.4% between 2017 and 2025, for the market to be worth US$7.8 bn by 2025. The market stood at a valuation of US$2.1 bn in 2016. Asia Pacific is the second-leading revenue contributor to global social media analytics market. Massive user base of social media channels such as Facebook and Twitter in countries such as India accounts for widespread demand of social media analytics solutions from businesses. Key players operating in the global social media analytics market include Brandwatch, Simply Measured Inc., Crimson Hexagon, Oracle Corporation, Talkwalker Inc., Adobe Systems Incorporated, NetBase Solutions Inc., Clarabridge, IBM Corporation, and Sysomos.